Agnes came across Bénédicte’s drawings at an end-of-year exhibition staged by the art academy of Braine l’Alleud. Driven by the strength of movement, her work, which comprises drawings that are embroidered, crumpled and creased to give them depth, is not only powerful but also demonstrates great purity. Her pieces are characterised by the clarity of the colours she uses, her light pencil strokes, criss-crossing threads and clusters of pinpricks that create a real explosion of energy and of zest for life, so much so that they can be heard crackling beneath the fingertips as you touch them. Bénédicte’s house is a real gem, full of objects reflecting all colours of the rainbow. 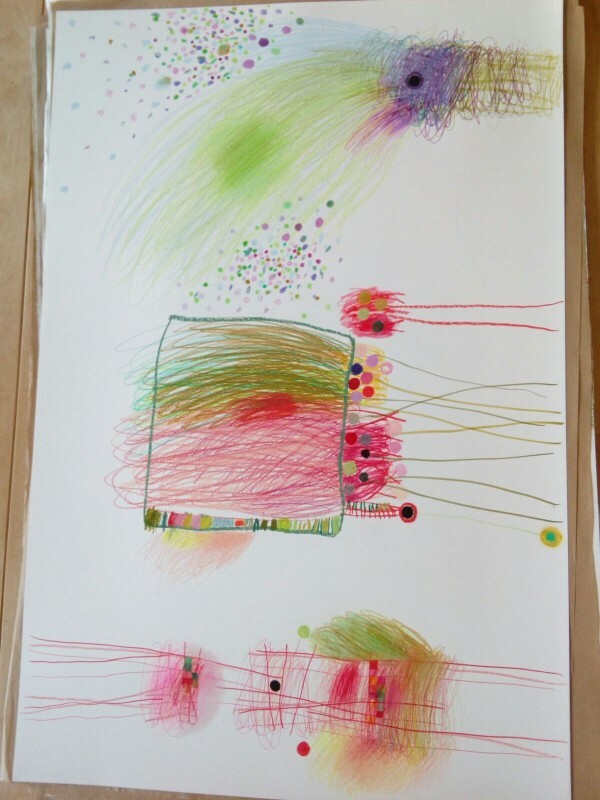 She is passionate about and inspired by the spontaneity of children’s drawings. She enjoys what she does and calls herself the queen of ‘craboutcha’.